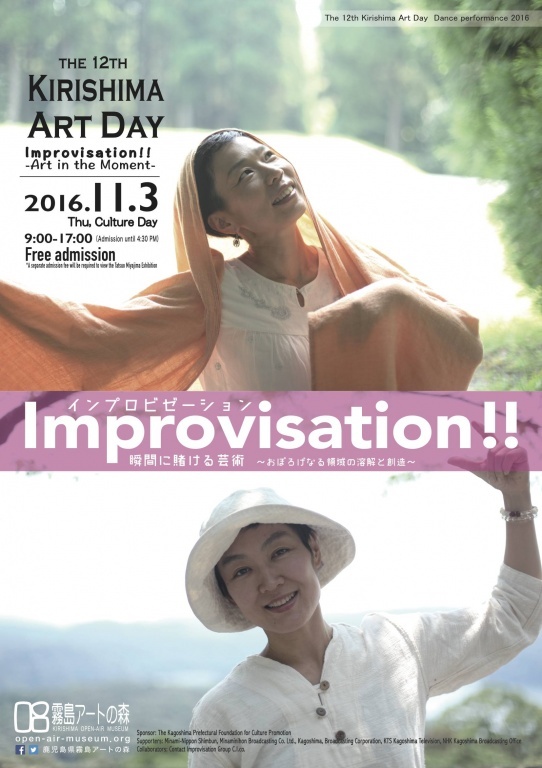 Every year at the Kirishima Open-Air Museum, Culture Day (3rd of November) is ‘Art Day’: a day when guests can enter the museum for free and participate in a variety of events that allow them to enjoy and familiarise themselves with contemporary art. For Art Day’s 12th anniversary in 2016, Contact Improvisation Group C.I.co will be producing a full day’s of events with an improvisational perspective, with the theme “Improvisation!! Art in the Moment”. The day will feature dance, music, voice, sculpture, painting and photography among other media, as well as live performances and conversations with past artworks. All of these will be linked through the common theme of improvisation. Lastly, we will hold a symposium where guests can hear about the different approaches to enjoying art from the perspective of performers, planners and supporters. Why not join us and make this Culture Day, ‘Art Day’? Fee: Free admission on Art Day *A separate admission fee will be required to view the Tatsuo Miyajima Exhibition. Collaborators: Contact Improvisation Group C.I.co.